Dr Cook still has the original newspaper article detailing KAH’s opening! In 1998, Dr. Morse Davis and Dr. Brent Cook were looking for a place to begin their own veterinary practice. 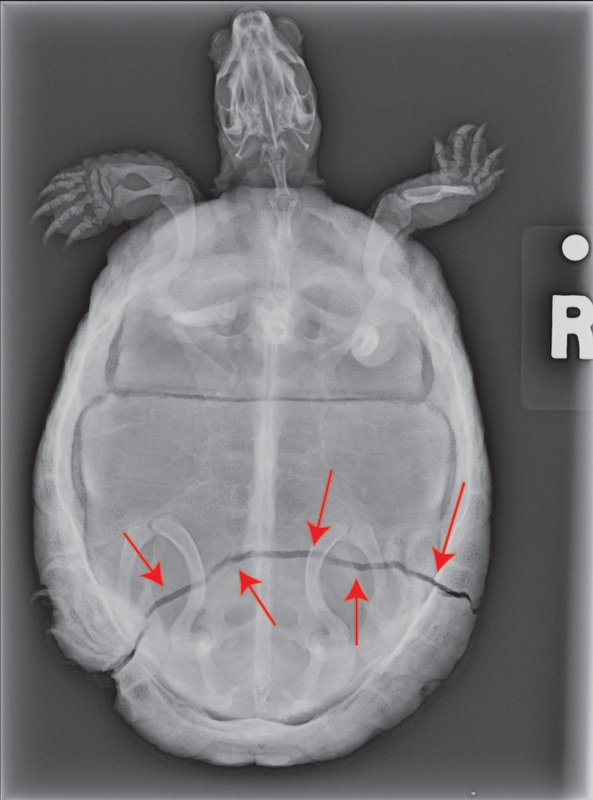 Both graduates of The Ohio State University School of Veterinary Medicine, each had worked in Maryland for several years, and they were ready to set out on the adventure of practice ownership. They searched in West Virginia, in Montgomery County Maryland, and even in Pennsylvania to find just the right spot. On their way home from such a trip, Dr. Cook noticed a new strip mall being built on New Design Road in Frederick. He and Dr. Davis contacted the landlord right away, and before they knew it, Kingsbrook Animal Hospital was opening its doors! Dr Cardella and Dr Cook visited KAH several times during construction! KAH began on March 15, 1999 as a three-doctor practice, with Dr. Cardella working part-time alongside Dr. Cook and Dr. Davis. The focus was on providing the best-quality medicine for our patients, while building real relationships with our clients and establishing a presence in the community. Over the coming years, Dr. Davis travelled to New York to assist with 09/11 cleanup and rescue, and the hospital staff participated in the Paws & Claws 5K run as well as open houses at Frederick County Animal Control. In 2004, Kingsbrook Animal Hospital achieved accreditation with the American Animal Hospital Association (AAHA), a third-party nonprofit organization that only certifies animal hospitals that maintain the highest standards of veterinary care. Word spread of the excellent care received at KAH, to the point where we needed more help. Dr. Jennifer Walker was hired in June of 2009 so that we could continue to accommodate new patients and clients. One of our former veterinary assistants, Dr. Jenny Lynch, graduated from veterinary school in 2011 and returned to Kingsbrook to work as a veterinarian. 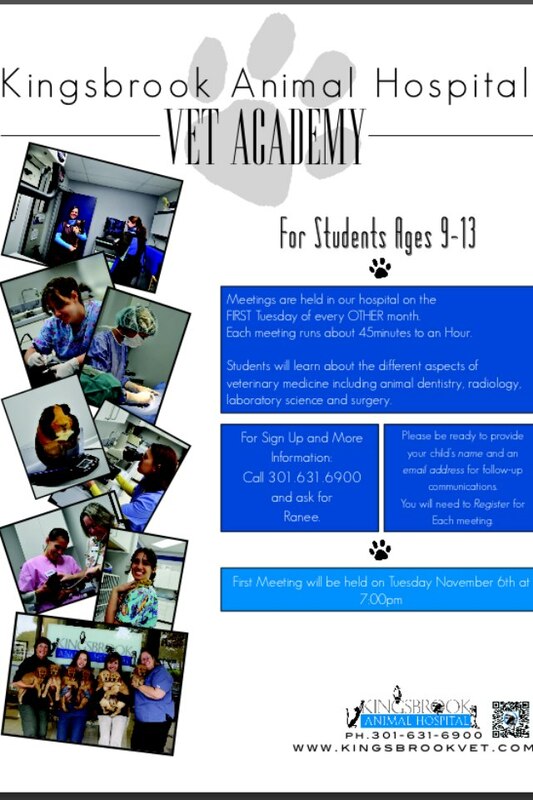 We started our Vet Academy program for kids interested in veterinary medicine in 2012. By 2015, we had 6 veterinarians, 5 Customer Service Representatives, and 15 technicians/assistants….and we were still growing! By 2015 KAH boasted 7 doctors–a big jump from the 3 we had in 1999! Dr. Cook and Dr. Davis started thinking about finding some more space for their growing practice. Fortunately, around that time the dry cleaner next door decided not to renew their lease. We were easily able to acquire the space, and we are so pleased to announce that we are expanding! In addition to “next door” we have also added ~1,000 square feet to the back of the existing hospital. Construction officially began on July 9, 2018 and is slated to take about a year to complete. We will be adding a new suite to accommodate our oral evaluations & cleanings, and several more exam rooms to help make space for appointments. Since construction is happening in our existing space as well as the new areas, we may be temporarily losing some space before we get to expand! We are grateful to all of our clients for being so patient and understanding. We are so excited to share all of our new “bells and whistles” with our extended KAH family! This entry was posted in community, Frederick MD, Kingsbrook Animal Hospital, veterinarian and tagged Frederick MD, history, Kingsbrook Animal Hospital, Veterinarian on September 7, 2018 by yourfriends. Kingsbrook Animal Hospital’s Five Fantastic, Fun Ways to Give Back In Frederick! KAH technician Julie’s own Sullivan proudly displays his blood donor ribbon! easy and free, and entitles donor dogs to free annual bloodwork and a guaranteed supply of blood if they ever need a transfusion. Look into doing therapy with a pet—visit nursing homes, hospitals, etc. Be sure the pet is up-to-date on all vaccines, and check with the facility before bringing any animals for a visit. It’s also possible to certify your pet for therapy. If Fluffy or Rover isn’t the most social, consider becoming a volunteer. Frederick County Animal Control is always looking for individuals willing to walk and socialize with the animals waiting for their forever families; click here for more information! The Animal Welfare League of Frederick is always looking for helpers, too. Even KAH’s mascot Moe got in on the Santa Paws photos! Visit Kylie & Cricket events—like Santa Paws or Haunted Hospital—to meet new friends and contribute to a worthy cause. Check Kingsbrook Animal Hospital’s Facebook page or the Kylie & Cricket website for more event information. When all else fails, anyone can make a direct donation to the Kylie & Cricket Memorial Fund. For pet owners with a busy schedule who are looking to make a difference, this is a fast and easy way to give back this year! Donations can be made on the Kylie & Cricket Memorial website, or in person at KAH. This entry was posted in community, Frederick MD, KAH Blog, Kingsbrook Animal Hospital, Kylie and Cricket Fund, veterinarian and tagged blue ridge veterinary blood bank, Frederick County Animal Control, Frederick MD, Kingsbrook Animal Hospital, Kylie and Cricket Fund, Veterinarian on February 1, 2017 by yourfriends. Fall In Love With Kingsbrook Animal Hospital: Meet Our Assistants! Our Veterinary Assistants at Kingsbrook Animal Hospital are an important part of the team. They set up appointments, care for our hospitalized patients, take radiographs, and even help fill in for our CSRs from time to time…among lots of other things! We’re excited to have the opportunity to introduce our current Assistant team this week. Ann—Ann is one of Kingsbrook Animal Hospital’s first employees; she’s been with us since March 1999! Ann says the one of the best things about KAH is that we are extremely environmentally conscious: we recycle, use green cleaning products, and source our electricity from wind power. Heather—Heather’s favorite thing about Kingsbrook Animal Hospital is “working in such a supportive and caring environment, with such amazing coworkers!” Heather has been part of our staff since July 2015. Robin with the one and only Johnny Blaze! Robin—Robin joined our staff in December of 2015. “We practice a very high quality of medicine while allowing our clients to be a part of their patient’s care—that’s my favorite thing about working at Kingsbrook Animal Hospital,” she says. 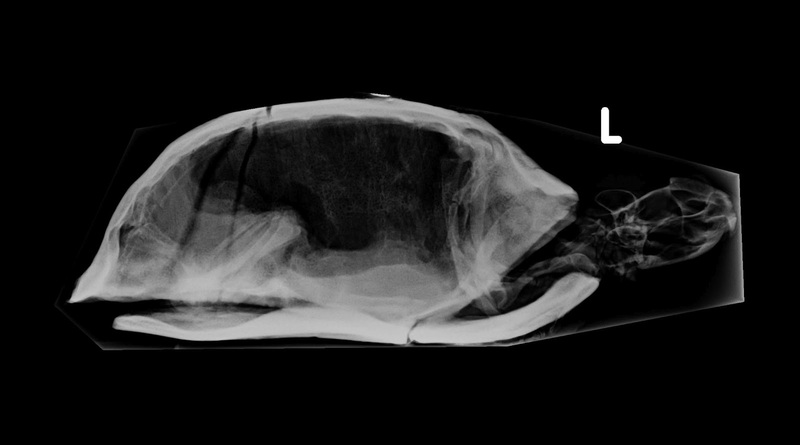 Ebony—Ebony is a technician’s assistant who has been working at Kingsbrook Animal Hospital since October 2015. Her favorite thing about working at KAH is interacting with patients of all species, and the satisfaction of helping animals. 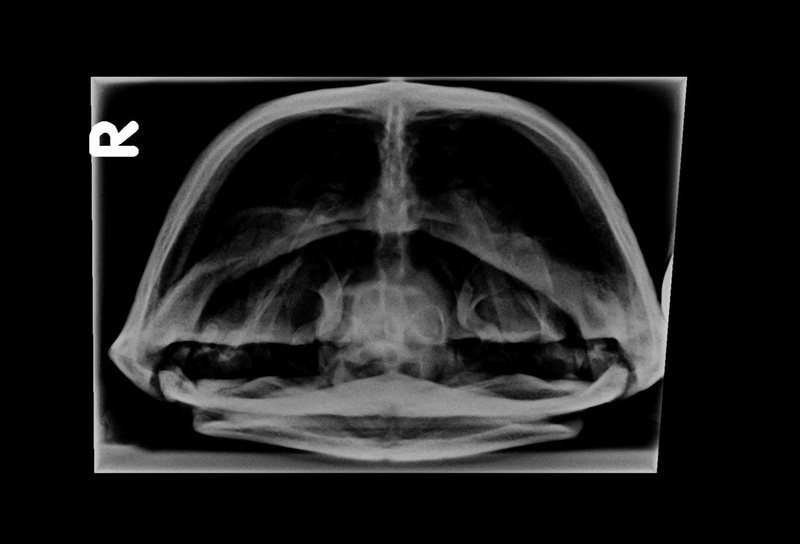 Tiki—Tiffany T usually goes by Tiki while she’s at Kingsbrook Animal Hospital! Tiki’s favorite thing about KAH is definitely her team members. She’s been an employee at KAH since August 2011. As you can see, we have a fantastic team of assistants! Next week (October 16-22) is Veterinary Technician Appreciation Week, so we’ll be introducing our superlative technician staff. Check in next week to meet these vital KAH team members! This entry was posted in community, Frederick MD, Kingsbrook Animal Hospital, Tidbits, veterinarian and tagged Fall, Frederick MD Vets, Kingsbrook Animal Hospital, Staff Appreciation, Veterinarian on October 11, 2016 by yourfriends. Fall In Love With Kingsbrook Animal Hospital: Meet Our Client Service Representatives! Here at Kingsbrook Animal Hospital in Frederick, MD, we have a wonderful team of Client Service Representatives! Our CSRs take on so many tasks for us every day, from scheduling appointments to creating social media posts, from giving directions to impromptu pet photography. We’re really proud of all of the work our CSRs do, so we’d love to take the opportunity to introduce each of our current Client Service Reps during the first week of our Fall in Love With KAH event. Tiffany K— Tiffany has been working at KAH since May of 2015. One of her favorite things about Kingsbrook Animal Hospital is that the doctors at KAH really enjoy their work, and that every single staff member is focused on providing great client care. Kelly— Kelly’s favorite aspect of KAH is her coworkers; “They’re not just fellow employees, they’re friends and even like a second family,” she says. Kelly has been with Kingsbrook since January of 2007. Elizabeth—Elizabeth is one of our newer team members, having started employment with us in April of 2016. Elizabeth loves KAH because of the chance to interact with the clients we’ve built a good relationship with already, and the chance to see the joy on the face of new pet parents when they bring their puppy/kitten/baby bunny in for the first visit. Justin with Kingsbrook’s own Mo! Justin—Also a new addition to the KAH team, Justin says the best thing about working at KAH is “The constant opportunities for learning, from the other staff members and even from our awesome clients.” Justin has been part of the team since July 2016. Maureen—Maureen has worked at Kingsbrook since June 2014. Being able to work with people who really love animals, and the fact that KAH is invested in learning and sharing knowledge, are Maureen’s favorite things about working at our hospital. We hope you enjoyed meeting part of our team! Stay tuned for new introductions each week. Next week, we’ll introduce KAH’s wonderful Veterinary Assistants! This entry was posted in community, Frederick MD, Kingsbrook Animal Hospital, Tidbits, veterinarian and tagged Fall, Frederick MD, Kingsbrook Animal Hospital, Staff Appreciation, Veterinarian in Frederick MD, Veterinary on October 4, 2016 by yourfriends. 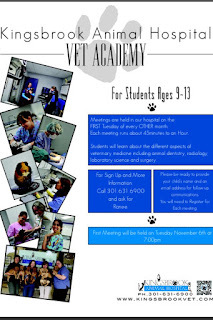 Coming in November: Vet Academy for Students 9-13! Call for Reservations. Tell your friends–Everyone is welcome to come. This entry was posted in community, Vet Academy on October 10, 2012 by yourfriends. This entry was posted in community, dog park opening, Frederick Dog Park on August 9, 2012 by yourfriends. Meet Malibu! She is the newest addition to Vet Assistant, Nicolette’s, family. She is a German Shepherd/Lab/Collie mix and is 5 months old . She was adopted through Frederick County Animal Shelter and has been in her forever home for 4 weeks. Her mother was 40lbs and her father was 50lbs putting her at a whopping 27lbs currently, so she is not going to get much bigger. Her favorite past times include running, chewing, playing fetch, trying to eat butterflies, and chasing the cat 🙂 She is a very smart girl and knows how to sit and lay down (we are still in puppy class)! 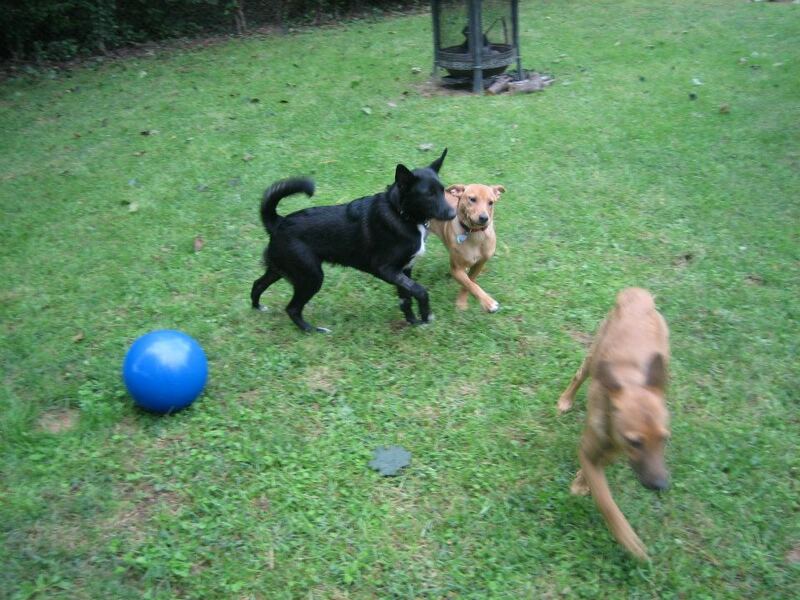 Just recently she was reunited with her sister, Cali, and brother, Patrick, from the litter and they had a fantastic play date full of wrestling! They are so funny, and kept everyone entertained! Needless to say they all slept very well that night! This entry was posted in community, Malibu, Nikki on February 22, 2012 by yourfriends.